Nokia N97 is currently not available in any stores. Listen to your favourite songs in music player. It supports MP3, AAC, AAC+, eAAC+, WAV, RealAudio 7, RealAudio 8, RealAudio 10, M4A (Apple lossless), MP4, AMR, etc. file types. Did we mention the hardware? 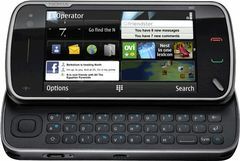 The N97's touch user interface isn't well integrated and can be inconsistent and confusing, especially compared with the competition. We would have preferred a capacitive touch screen instead of resistive.